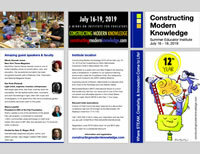 YouTube Filmmaker Casey Neistat delivered a terrific and inspirational presentation at Constructing Modern Knowledge 2012. Video of that fantastic session will be uploaded here in the near future. Subscribe here to be alerted when that video becomes available. In the meantime, enjoy a recent TEDx Talk by Casey.